The owner of Xerox’s Norwalk headquarters has begun marketing the building for the first time since Xerox’s arrival in late 2007, with the document technology giant tight-lipped still about its plans going forward after a lease expires later this year. In a brochure posted online titled “Introducing 45 Glover at The Towers,” Building and Land Technology touts the merits of Xerox’s headquarters at 45 Glover Ave. The advertisement expounds on the building and drops the names of General Electric (NYSE: GE) and Diageo (NYSE: DEO), which occupy adjacent buildings in the three-site Towers complex, but leaves conspicuously absent the Xerox (NYSE: XRX) moniker despite the company’s universal renown as a Fortune 500 company. A Xerox spokesman did not provide insight into the company’s current headquarters plans going forward. Built in 2001 by BLT, the Xerox building totals more than 250,000 square feet of space, with the corporation sharing the building with Aon Hewitt, a human resources consulting subsidiary of Chicago-based Aon. 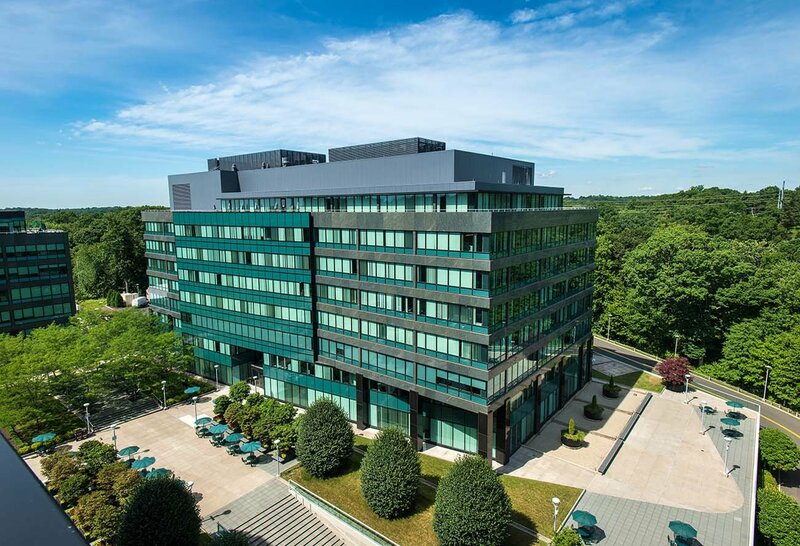 Bridgewater Associates has also used the building as an extension of its hedge fund operations based in Westport, with Bridgewater having taken space in Stamford as well at BLT-built offices. Any loss of Xerox would represent only a temporary economic blow for Norwalk given the proven appeal of The Towers complex to corporations, but perhaps a more punishing psychological hit for Connecticut, which is fresh off major commitments for renewed investment by Henkel, Lockheed Martin, United Technologies and General Dynamics. Even as they did so, a stream of former GE headquarters employees from Fairfield have taken up new quarters at 901 Main Ave. across from Xerox headquarters in The Towers complex, following the August departure from Fairfield of 200 senior GE executives to a new headquarters in Boston. Xerox is in the process of splitting into two independent companies, with the new Conduent taking over business process outsourcing operations Xerox bolstered in 2010 with the acquisition of ACS. Xerox CEO Ursula Burns plans to retire when the split is complete, with senior executive Jeff Jacobson slated to take the top job. Jacobson last listed a residence in Purchase, N.Y. just over the Greenwich border, while Conduent’s incoming CEO Ashok Vemuri lived in New Jersey at last report. Xerox moved its headquarters to Connecticut from Rochester, N.Y. in 1969, in part to be able to recruit executives from the orbit of New York City. Until 2007 it was located at 800 Long Ridge Rd. in Stamford, used since by GE Energy Financial Services.